HMRC finally managed to swing the axe successfully against a football club today, and Hyde United were the victims. It’s ironic, really. Hyde, as have so many small clubs for as long as any of us can remember, have been occasionally poorly run over the last few years, but they were by no means the worst offenders in the game. It is they, however, that took the fall today – a fall which is a pretty sad reflection of the running of the semi-professional game in England, the failure of the authorities of the game to actually address the matter of the mismanagement of smaller clubs and, ultimately, regulations that exist within football which meant that this was going to happen to someone, sooner or later. The Hyde United Football Club which was throttled in court today was not, for the record, the same club that lost 26-0 against Preston North End in the FA Cup in 1887. The club which lost that match, Hyde FC, underwent several incarnations at the end of the nineteenth century before finally folding in 1917. Hyde United were a new club, formed two years later with a new name, so that they wouldn’t be held liable for the debts of the old club, even though they continued to use Ewen Fields, which had been the home of Hyde FC since 1906 and remains so to this day. Hyde United’s history isn’t especially glorious. They were founder members of the Northern Premier League in 1968 before having to resign due to financial problems two years later. They stayed in the Cheshire League for twelve years before winning promotion back. For the rest of the 1980s and the whole of the 1990s, Hyde United probably came closer than any other club to getting promoted into the Football Conference without actually managing it. Between 1985 and 1999 they finished in second place three times and third place twice in the Northern Premier League, but this didn’t come without a small degree of controversy. They sold Ewen Fields to Tameside Council in 1985, and the council promptly installed an artificial pitch there and redeveloped it as a community leisure facility under the name of “Tameside Leisure Park”. The pitch remained in place until 1995. As if to cement their “nearly men” status, they also reached the semi-finals of the FA Trophy twice, in 1988 and 1996, without making it to Wembley. Since 2000, however, the club has been in decline. 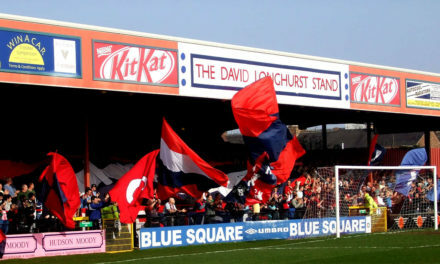 They were relegated in 2003 and the reorganisation of non-league football meant that they had to win two promotions to get back into the Blue Square North – the division below the Conference that they had so nearly got promotion from so many times. They did this with two successive title wins, but the second of these was mired in controversy when, in 2005, they benefited as the result of Spennymoor United (who had failed to complete their fixtures that season) at first having their results expunged from the record and then having them reinstated. There is more on what was possibly the most bizarre end to an English football season ever here. Hyde United had a debt to HMRC of in the region of £180,000. This is not the biggest accumulated debt in the history of non-league football. How, then, did it come to this? It is possible that the directors of the club made a horrific calculation in not shielding it from further legal action by placing it into administration. The first winding up petition was heard in May of this year, and when the club asked for a further eight weeks the registrar declined the request, advising that the current proposals were “too little too late”, before adding that “this club is wholly insolvent”. The club is currently looking into how they may appeal decision, but it seems unlikely that decision will be reversed. The Blue Square North will, barring a miracle even greater than that which came to pass at Farsley Celtic last month, play the rest of the season one team short. Difficult though this may be for Hyde supporters to swallow at present, HMRC aren’t to blame. As has been discussed on here before, the Enterprise Act removed its status as a preferred creditors, meaning that it has acted more aggressively. The Football Association, the Football League and the Football Conference – indeed, every single authority within the game – has been warned of the dangers of maintaining other football clubs’ status as preferred creditors under the rules of the sport (even if there are sound reasons for these rules being in place in the first place). These warnings have not been heeded, and the price may now be starting to become apparent. Rochdale were in court today fighting off a petition. Accrington are fighting to pay that £308,000. Farsley Celtic went so far as an announcement from the administrators running the club that they were being wound up. This has been on the cards. If Hyde United escape, it will be an even more miraculous escape than Farsley’s. If they don’t, a new club will surely form for next season, most likely playing at the bottom of the North West Counties League. It almost goes without saying that any new club should be owned and run by its supporters. It’s time for a phoenix to rise from the flames. A very sad tale but on the other hand, why should clubs who are properly structured and pay their debts be at a disadvantage to clubs who decline to pay and spend the money on the pitch instead? Many more may follow before chairmen and fans get their heads out of the clouds and live within their means, even if it means a bit less “success”. A legacy of Thatcher’s Britain I’m afraid. It would be good if you contacted someone at the club or the supporters to explain the situation in some clarity. In a nutshell, Hyde had big money backers who accumulated tax debts by paying contracted players large wages, and liabilities in the form of the contracts. They are actually a pretty well run club and with the expiry of the contracted, big money players a lot more solvent in cashflow terms than they might be. The backers suddenly pulled out leaving the current horrible mess that’s there at the moment. It’s a real shame – the fans are some of the funniest people I’ve ever met, and a really passionate bunch. Hyde United is dead – long live FC Hyde! “A legacy of Thatcher’s Britain I’m afraid.” wtf?? Amazing that Maggie is being blamed for football clubs overspending, like it never existed before she got into power. Nowt to do with her, or the Tories. Greed was around a lot well before them. Agree with most of the comments above. However it does seem a little unjust when you see how Farsley (4 promotions in 5 seasons on taxpayers money)have dodged their responsibilities and those parasitic serial offenders Northwich Victoria (still full time owing £400k+)have got away with it once again.